Size: Face 2 1/2" x 3 1/2", overall 11 3/4"
The Rada Non-Scratch Spatula is no ordinary spatula, but one designed to be used both when cooking with protective coated cookware as well as with the traditional stainless steel pans. This large spatula is made from non-scratch, heat resistant material ideal for both cooking and serving your favorite foods. The material makes it safe for use with non-stick pans, meaning the Non-Scratch Spatula won’t scratch or damage your cookware. It features a beveled edge for efficient scraping, an oval handle with thumb spot for an easy grip and a purposely steep angle for easier flipping. This non-scratch spatula will just make meal preparation that much more convenient. You’ll love using it with eggs, grilled cheese, hamburgers, pancakes, and more! 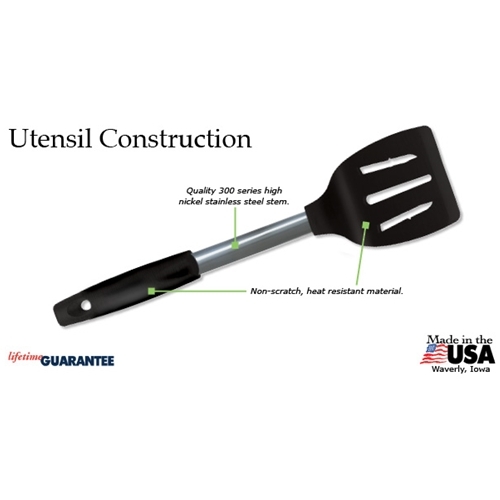 Our customers agree that this is the best spatula that they’ve ever used.